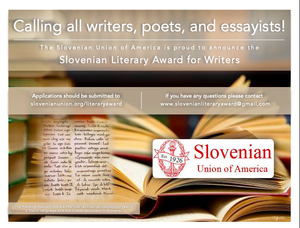 The Slovenian Union of America (SUA) has announced the Slovenian Literary Award to recognize and promote writers of Slovenian heritage. The award is open to both first time writers, as well as published authors. 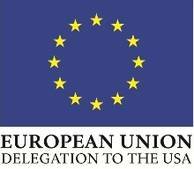 For nearly a century, the Slovenian Union of America has been dedicated to preserving the legacy of their Slovenian ancestry. Writing has been a formative part of Slovene heritage and the SUA Slovenian Literary Award acknowledges those who continue the vital tradition. The award is not limited to English, both English and Slovene will be accepted. Works are judged on quality by a panel of writers and committee. Applicants may live anywhere but must be of Slovenian heritage. Individual writers only (no groups) with up to three submissions per writer. Membership in SUA is not required.